Potato diet is an effective method of weight loss, thanks to which you will cleanse the body of toxins and excess of kilograms. This simple diet with potatoes can be recommended in any transitional period, when body detoxification is necessary. Although previously you could read that these foods will add weight, and that even excessive consumption of potatoes can lead to diseases as diabetes type 2, the latest studies proves just the opposite. Researches from San Diego tested 5800 people, including demographic variables, which analyzed daily food intake, and among other things, the impact of the potato on the occurrence of certain diseases. Research in no way correlates the consumption of potatoes with the emergence of obesity, diabetes or an elevated level of C-reactive protein. Potato diet was first mentioned by European immigrants in America, where they used this food for detoxification of the body and deep cleaning of your body. Potato diet has several variants which differ primarily by the duration but also by the weight. The first of them is quick diet in three days, and we will say couple of things about it. 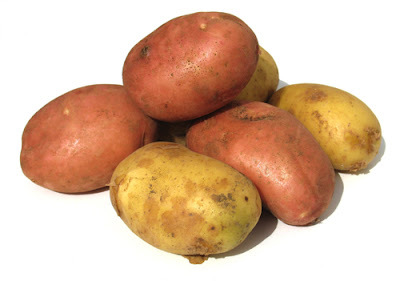 During that period, every day take 6 potatoes, wash them thoroughly, cut in big slices and bake them in the oven. When they are nice golden brown, remove them from the oven and eat during the day. The resulting number of potatoes should not exceed more than 1 kg. With each potatoes drink 2 glasses of water, which means that you drink up to 12 glasses a day. This potato diet will certainly reduce your weight but it should not be kept more than three days, because it is quite restrictive. In the slightly longer diet apply the same methods as in the above recipe with the difference that you bake up to 1.5 kg per day. Divide baked potatoes to 5’6 portions and eat during day. Add a little butter and olive oil, but do not add any spices. The rules are the same except that you can bake up to 2 kg of potatoes per day. Freely add salt, spices of herbs, garlic, butter. Also during this period you can make the mashed potatoes recipe without milk, use a little butter and water. This potato diet will not be harmful to your health because it contains a sufficient amounts of vitamins and minerals (such as potassium, calcium, magnesium, phosphorus and iron) as well as protein and can be kept for two weeks. Caloric value of it 1250 kcal a day. Potato abounds in amino acids (lysine), vitamin B2 and pectin. If everything you read sounds monotonous and you are sick and tired of roasted potato, we have prepared another diet for losing weight, which also includes as well as other foods. Dinner: Baked potatoes with a spoon of oil. Bake for 40 minutes in the preheated oven at 200 degrees, required under aluminum foil. As we gave four similar diets above the experiences are not the same for each of them. A common thing is that meals are followed by 2-2.5 liters of fluid will not leave hungry. Nutritionists believe that the three-day potato diet is a typical instant method, which you can only use to clean toxins but cannot bring significant result in the elimination of excess kilograms. They also do not agree with the removal of bread and rice during the diet, because they are extremely rich with carbon fiber. The conclusion is that this cannot be a long-term diet plan, but it is certainly good to know that boiled potatoes or baked potato does not cause weight gain if prepared like this. Which certainly causes weight gain are fried potatoes and worst of all are industrial chips, which you are advised to avoid in every possible form, because the long-term use can harm health due to the huge amounts of trans-fats. In an average potato of medium size, there is about 150 calories, and potato does not cause problems. The risk increases with the so-called preparation, which is often overdone with sauces that are high-caloric, additives in the form of cream, margarine, butter and in the worst case it fried which is not healthy and useful. When you fry it over high heat acrylamide is created, a poisonous substance, which has been shown to be able to induce cancer while for men it is not reliably confirmed, and it has not been established what amount of exposure is needed to harm us. Diet without carbohydrates, paleo diet, and many others which have already been discussed are also responsible for a bad reputation which potatoes diet has. Allegedly because of a higher input of carbon-hydrates. Take everything with a grain of salt because it was determined that potato is a rich source of fiber, vitamin C and potassium (especially bark), and if it is prepared properly and combined with other ingredients represents a healthy food. For this diet it is not exactly determined whether the kilograms come back later on, if you do not like this concept, we recommend that you read the following articles: chrono nutrition, and un diet.